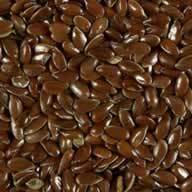 Flaxseed oil is obtained from the seed of the flax plant. The Benefits of Flaxseed Oil is the high content of omega-3 fatty acids - 50% to 60%. This amount is roughly double that contained in fish oil. Flaxseed Oil contains omega-6 and omega-9 essential fatty acids, B vitamins, potassium, lecithin, magnesium, fiber, protein, and zinc and also provides approximately 50% more omega-3 oils than what you could get from taking fish oil, minus that horrible "fishy" after taste. Flaxseed oil is derived from the seeds of the flax plant. Flaxseed oil contains substances that promote good health. Flaxseed oil is rich in alpha-linolenic acid (ALA), an essential fatty acid that appears to be beneficial for heart disease, inflammatory bowel disease, arthritis and a variety of other health conditions. It is important to maintain an appropriate balance of omega-3 and omega-6(another essential fatty acid) in the diet as these two substances work together to promote health. Flaxseed oil is available in liquid and softgel capsule forms. Like any oil, flaxseed oil may turn rancid if it is not refrigerated. Flaxseed oil requires special packaging because it is easily destroyed by heat, light, and oxygen. The highest quality flaxseed products are manufactured using fresh pressed seeds, bottled in dark or opaque containers, and processed at low temperatures in the absence of light, extreme heat, or oxygen. Be sure to buy flaxseed oil supplements made by established companies who certify that their products are free of heavy metals such as mercury. One Tbsp liquid flaxseed oil per day, or 3,000 mg (capsules) twice daily is generally recommended as an appropriate initial dose. Ground flaxseed or flaxseed oil? Liquid flaxseed oil is the easiest form to use, although it must be kept refrigerated. It is available either in liquid form, or in capsules. I buy Barlean's Brand from Amazon (I believe it is the best quality on the market). To get the benefits of flaxseed oil every morning I have the oil in a shake (it is delicious). If you prefer to use ground flaxseeds, just sprinkled 1 or 2 tablespoons on salads, cooked vegetables, or cereals. Flaxseeds have a pleasant, nutty flavor and taste good. I put in on my cereal every other morning. I recommend you grind the seeds (or buy ground flaxseed, which is also called flaxseed meal) because whole seeds simply pass through the body. Grinding the seeds just before using them preserves flavor and nutrition, but pre-ground seeds are more convenient. Keep them refrigerated. There are no nutritional differences between brown and yellow seeds. I buy Bob’s Red Mill, you can get this either in Trader’s Joe or most grocery stores carry it. For best absorption, take flaxseed oil with food. It is easily mixed into juices and other drinks, and its nutty, buttery flavor complements cottage cheese, yogurt and many other foods. You can also use it instead of olive oil in a salad dressing. Don't cook with it, however, as this will deplete the oil's nutrient content. In the mid 1950's, Dr. Budwig began her extensive research on the benefits of flaxseed oil because of its rich essential fatty acid content known as "linoleic and linolenic". Dr. Budwig assisted many seriously ill, even those who were given up for terminal by orthodox medical doctors, helping them to regain their health through a simple regimen of flaxseed oil blended with cottage cheese. Dr. Budwig supplemented her patients' diets with 2 tablespoons of flaxseed oil combined with 1/4 cup of cottage cheese. Dr. Budwig found that a yellowish green substance in their blood was replaced with a healthy red pigment, hemoglobin. She also found that the tumors receded and disappeared, anemia was alleviated, and vital energy was regained. Flaxseed oil is made more effective when 2 tablespoons of the oil are added to 1/4 cup of cottage cheese. The essential fats bind to the proteins in the cottage cheese making them more easily absorbed by your body.